The Rock River Times has three great sports columnists: Doug Halberstadt, Matt Nestor and Todd Reicher. Rockford Sports News features these columnists' articles in our breaking news feed and in an RSS feed link list on Rockford Sports News home page. I encourage to read their articles in print or online and contact them with your sports questions and story ideas. 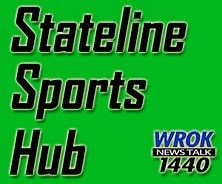 Matt Nestor also co-hosts The Stateline Sports Hour talk radio show Saturday mornings on WROK radio. Listen to Stateline Sports Hour on your radio or via podcast. RockfordSportsNews.com original material is Copyright 2013 ® Paul Gorski. Links are provided to various local TV, Radio and Newspaper sources, and those links may take you to additional copyrighted material. The opinions expressed here may not be shared by the organizations listed, nor do the media outlets or organizations listed endorse the information posted here. RockfordSportsNews.com is a nonprofit, noncommercial educational news reporting venture. The links to other content are presented under the Fair Use doctrine of US Copyright law, as the links are presented for news reporting and nonprofit educational purposes. Please send site suggestions and links to local sports organizations to editor@winnebagocountynews.org and thank you for visiting!